The socialist leadership seeks to remedy the tattered fabric of Havana’s built environment by drawing on a comparative advantage: tourism. Since 1959, tourism had never been a leading economic sector. Fidel Castro had often vowed that Cuba would not become an island of bourgeoisie-catering bartenders and chambermaids as did other Caribbean nations (Eckstein 1977). Accordingly, in 1975, just 25,000 nonmilitary foreigners visited Cuba, while in the year 2000, the figure should approach two million (Scarpaci 1998a). Following UNESCO’s recognition of Havana as a World Heritage Site, few planners, architects, and politicians imagined that in just seven years, the USSR would disband, and Cuba’s economy would enter a tailspin. In the uncanny fashion that the revolutionary leadership views opportunity in times of crisis (Codrescu 1999), attention was again cast on Habana Vieja, the city’s original gateway to the world. This essay examines the revitalization of Habana Vieja and the role played by Habaguanex, S.A (incorporated) in that process. It also considers how that firm works with international financiers in both joint-venture arrangements and the symbolism of restoring the old city. Revitalization refers to the general physical and socioeconomic enhancement of a designated built environment. In the United States and Canada, revitalization frequently entails public-private partnerships. In Habana Vieja, the process depends mainly on joint-venture deals or direct intervention by Habaguanex, S.A. A state company headed by the City Historian, Habaguanex oversees public works, historic preservation, and refurbishing older buildings since the early 1990s. Its budget comes from hard-currency operations in tourism, general retailing, restaurants and bars. Elsewhere, I have argued that historic preservation has unleashed gentrification in Habana Vieja (Scarpaci forthcoming; 1998a; 1998b). In U.S., Canadian and Western European cities, the “gentry class” tends to be better educated and more affluent than local residents, but are usually of the same nationality (Ley 1996). While in many Latin American cities street vendors irritate gentrifiers (Jones and Varley 1994; 1999), this is not a problem in Cuba. In Cuba, the gentrifiers1 are a transient group made up of foreign tourists or business people from Canada, Western Europe, and Latin America. I aim to situate the process of historic preservation in a broader context of geography of heritage, to which we turn in the following section. A GEOGRAPHY OF HERITAGE: WHOSE PAST, WHOSE MEMORY? The study of landscapes of the past is fundamentally a geographic inquiry because of the concern over location and the social, economic and political forces that give shape to those places. Heritage means using the past as an economic resource for the present. Historic places allow nation states to create national identity, forge ideologies and to “ground” abstract notions into tangible forms (Hobsbawm 1990; Hall 1995; Woolf 1996). The desire to preserve relics of past environments is frequently tied to influential elites. However, the tension created over what is to be preserved, and whose collective memory should be celebrated, is often ignored in official public circles. A bewildering array of places and objects can determine the issues used in legitimizing power structures (Graham, Ashworth and Turnbridge 2000). Significantly, the many ways these landscapes are created is not unique to either market or centrally planned economies. Economic place images even drive the present construction boom in the United States. Walt Disney Corporation created Celebration, Florida —a planned community— as a theme to embrace the pre-automobile era that characterizes Disney’s Main Street boulevard at Disney World. Not so many years ago, Eastern European and Soviet public housing brandished banal high-rise housing units to impose a stamp of equality on all its citizens. Geographer David Lowenthal argues that the built environment, especially reconstructions of the past, give familiarity and guidance to present-day generations. At the same time, heritage in the form of historic preservation can legitimize the history of local people, as well as invoke negative images of the past (Lowenthal 1985). In an era of rapid and affordable travel for the middle classes, heritage is becoming a driving force in international tourism. Hewison captures this globalizing trend by arguing that heritage is manufactured like a commodity, “which nobody seems able to define, but which everyone is eager to sell” (Hewison 1987, 9). If heritage tourism is commodified, then, a further layer of tension is grafted onto local communities in developing nations where the need for hard currency conflicts with local residents. What sets historic preservation apart in Old Havana versus the rest of the nation is that aside from a few museums, most of the built environment that is being restored marks a time during the Republican and colonial eras when Cuba was deeply exploited. It is ironic, then, that those relics of bygone era are noteworthy in a centrally planned economy. This reconstruction is not free of tension, and Cuba’s economic quagmire reflects that tension as noted below. Habaguanex grew out of calamity. In June 1993, an architect from the National Center for Conservation, Restoration, and Museum Science (CENCRM) had been escorting Jonathan Glancey, a journalist from the London tabloid, The Independent, through Habana Vieja. Along the walking tour, the Cuban architect pointed out buildings around Old Square (Plaza Vieja), a district full of grand old casas-almacenes that served as 19th century houses and warehouses (Segre, 1995; Segre et al. 1997, Chapter 2). As the journalist paused to photograph a turn-of-the-century structure that was undergoing renovation, the building suddenly collapsed. Recent rains had saturated the crushed-rock materials (mampostería). Apparently, a load-bearing column gave way. The British media reveled in the remarkable photographs. They underscored the physical decay of Habana Vieja. The story became syndicated and its comments were newsworthy: “No one died in the collapse of Plaza Vieja…Neither, remarkably, was anyone killed later than evening when a second building imploded on the Malecón [the seaside promenade].” As one Cuban architect aptly described the relationship between environment and colonial architecture: “In this weather (86 degrees, 100 percent humidity and frequent storms)…we can expect there to be several more collapses” (Glancey, 1993). I believe that the creation of Habaguanex, by the Council of State through Law Decree 143-93 shortly after the Plaza Vieja incident, was not a coincidence. The company is part of the Office of the City Historian, headed up by historian Eusebio Leal Spengler. Habaguanex assumed legal right to operate restaurants, museums, gift shops, and hotels that other state agencies (CIMEX, Gran Caribe, Horizontes, Havanatur, and Rumbos) had managed. As part builder-developer and part tourism promoter, Habaguanex2 claims on its web site that there is “intense and happy nightlife [in Habana Vieja] that creates in cafeterias and restaurants, open 24 hours, a festive and bohemian ambience of quality and pleasure” (Habaguanex, S.A., www.habaguanex.com). The Office of the City Historian designed and implements the Master Plan for Old Havana’s Revitalization that manages land use and investment priorities for the 214-hectare and 242 blocks of Habana Vieja. The area includes some 4,000 buildings, of which just under a quarter (900) possess heritage value. Development projects concentrate heavily in the northeast corner of Habana Vieja, around the Plaza de Armas, Plaza de San Francisco, the cruise ship terminal, and Plaza Vieja. Eusebio Leal recently told an economist of the U.S. International Trade Commission— an independent nonpartisan federal agency— about the effect the embargo has on Habana Vieja and, in turn, Habaguanex operations. “You would see cruise ships full of American tourists arriving here,” remarked Leal. “We would be able to buy more cheaply the materials needed to renovate…old buildings” (Snow 2000). However, it is unclear how much of such revenues might accrue directly to the residents, versus sustaining the socialist establishment. Nonetheless, if “sustainability” is a term debated widely around the world (Dyck 1998), in Habana Vieja it has surely come to mean self-financing (Grogg 1999). Habaguanex is a unique public entity. It is one of the few Cuban companies in post-1959 Cuba to manage dollar-operated facilities but not have to remit profits to the main legislative body, the National Assembly. Nor must it arrange joint venture deals for historic preservation through the Ministry of Foreign Investments (MINVEC) as do all other public entities. Instead, it negotiates historic preservation and new construction projects directly with foreign capitalists. Its fiscal autonomy and decentralized decision-making ability are unique in socialist Cuba. From a design and planning perspective, its principal duties allow the firm to use profits to refurbish the UNESCO district. Elsewhere in Cuba, the general tenets of the Foreign Investment Act of 1995 stipulate the conditions under which joint ventures must operate.3 Habaguanex, though, has much autonomy. This legal framework spells good news for historic preservationists and more than a few European and Canadian tourists. However, one question rarely posed is: What about the residents of Habana Vieja? As Diane Barthel (1996) has argued, authenticity in historic preservation projects is an elusive goal because social classes have different allegiances to the built environment. The tensions between architectural authenticity and social actors —politicians, tourists, investors, and local residents— fashion the collective memory of places. Habana Vieja, like other historic centers, beckons the question: Whose history and collective memory will be forged under Habaguanex’s charge? Habaguanex’s primary responsibility is to generate dollars. In 1995, it generated $5 million USD in gross revenues. Its 1997 figures were estimated to be greater than $10 million. In early 1999, the figure stood close to $40 million and by the year 2002, Habaguanex revenues should approach $200 million (Burr 1999, 73). Habaguanex CEO Eusebio Leal stated that investment in Habana Vieja in 1999 exceeded the previous four years combined. Moreover, the firm employed 3,000 construction workers in 163 restoration projects, not all of them joint-ventures (Leal 1999). Although it employs 3,000 construction workers—many of whom reside in Habana Vieja—the economic multipliers for local residents are limited. Because it is a commercial enterprise,4 it has a different legal relationship to the residents of Habana Vieja than, say, the Ministry of Housing does. Through its Cuban building partner Fénix (Phoenix) and its real-estate agency, Aurea, the company engages in ambitious construction projects in the old city. To be sure, not since American businesses set up banks and corporations there between 1902 (the formal end of U.S. military occupation) and 1920 (the year of the “dance of the millions,” a year when world market prices for sugar sky-rocketed) has their been such a flurry of construction activity (Weiss 1950; Llanes 1993). Several Habaguanex interventions are noteworthy. These include the restoration of buildings on the Plaza de Armas, Plaza de la Catedral, and Ambos Mundos Hotel (where Ernest Hemingway resided). Another major project is the renovation of the former stock market of Havana (Lonja de Comercio) on San Francisco Square, facing the new Italian-financed renovation of the ocean terminal at Sierra Maestra docks. The Lonja de Comercio project relied on Spanish investment capital for approximately $12 million USD. Intervention in the building’s interior entailed relocating the front stairway to the back of the building, installing two pairs of elevators, updating office space for new technology (FAX and Ethernet connections), building a café and post office on the ground floor, and constructing a dark-glass encased floor on the roof.5 Adjacent buildings surrounding San Francisco Square include another post office, a money exchange house, an upscale tea shop and restaurant, and the Italian clothing chain, Benetton. To many local residents it is a great irony that an $85 pair of jeans, equivalent to a half year’s earnings for an average Cuban worker, is sold in a socialist city where many basic needs are unsatisfied (Nickel 1990). However, just like the planning and design strategies of the Republican era that aimed to forge a good impression on visitors who gazed out from the rails of steamers coming into Havana Bay (Schwartz 1997), Habaguanex wants to make sure that San Francisco Square “impresses” cruise ship passengers as they spill into streets of Habana Vieja. What waterfront visitors do not count on, however, is the foul stench of Havana Bay. It is one of the most heavily contaminated bodies of water in the Caribbean, receiving several hundred tons of organic material and oil products daily (Díaz-Briquets and Pérez-López 2000, 245-247). Habaguanex competes indirectly for foreign investors and partners with other Cuban tourism companies such as Gran Caribe, Horizontes, and Cubanacán. Like other Cuban firms, Habaguanex allows partners to enjoy the right of owning a majority of shares in enterprises the government has prioritized. Tourism is the main sector that has received joint-venture support, absorbing more than half of all investments in the 1990s (Peters 1999). Inherent in these joint-venture deals is the ability for the foreign counterparts to freely repatriate profits. They are also exempt from certain custom duties, taxation on salaries for foreigners, and strikes, but may avail themselves to special Cuban-government services (architectural and legal) and related benefits (Mesa-Lago 1998, 181). As many authors have noted (Werlau 1998; Jatar-Hausmann 1999, 125), the number of declared joint ventures versus those that actually deliver goods or services varies. Thus far, I have argued that unique historical circumstances have earned Habaguanex, S.A. considerable autonomy in its operations. Because of the symbolism inherent in Habana Vieja, and the bad public relations that resulted from the 1993 building collapse, Habaguanex has been able to move very quickly in carrying out its work. However, like all Cuban companies, we cannot review financial statements and balance sheets about the firm’s annual performances. Therefore, I will turn to other secondary data sources that identify how Habaguanex has entered working relationships with foreign partners. I will use the example of two hotels: one under construction (Hotel Saratoga) and one completed (Parque Central) as examples of Habaguanex’s special relationship with foreign firms. Not all Habaguanex-refurbished buildings are gutted this way. Santa Teresa, Ambos Mundos, and Hotel Florida are renovation sites that were not “hollowed” out in the gut-and-preserve fashion of the Hotel Saratoga. The gut-and-preserve approach is conducive to sites that are very large (more than 80 rooms) or whose infrastructure is dilapidated and would require considerable time and expense to bring up to contemporary standards. My sense, though, is that the gut-and-preserve approach is simply quicker than the more laborious and tedious type of historic preservation. In the end, dollar-generating abilities come on line more quickly for the state using gut-and-preserve. Remuneration terms make joint ventures attractive for non-Cuban financiers. It would seem that Article 33.4, Chapter XI, Labor System, of Law 77, the Foreign Investment Act, is the most deleterious to Cuban architects and engineers. The article mandates that “payments to Cuban workers…are made in national currency which must be obtained beforehand from convertible currency.” This is the well-known clause that pays Cubans about one-twentieth of what their foreign counterparts earn in dollars, or what said Cubans would receive if they were paid in convertible currencies. The justification for paying Cubans in local currency is that their education was paid for by the state, and that they continue to receive free health care and pay little for housing. My impression is that most Cuban professionals who work in the construction of or operation of hotels that were arranged through Habaguanex joint-ventures believe that this is a ruse; they expect more than a little bag of soap at the end of the month. Instead, a cash payment in dollars would appear to be commonplace as well as sharing quality meals and beverages with the foreign counterparts on a regular basis.7 One vignette from the Parque Central illustrates the importance of this remuneration (Box 1). Historic preservation in the old city also creates tension between foreign investors (who tend to favor turnkey hotel and construction operations and who prefer architects from their countries), versus Cuban professionals. One case in point is the Dutch-operated (Golden Tulip) Parque Central located on the park of that same name. In the mid-1990s, Cuban architects submitted numerous designs for Parque Central Hotel at the west-central edge of Habana Vieja. In the end, a feasibility and design project submitted by a Spanish outfit, allegedly for half a million- dollar fee, won the design competition. One Cuban architect remarked, “With that kind of money, dozens of local architects could have received a stipend for two-months of work while they were completing their Parque Central submissions. It would have given them money to buy drafting materials too. And I bet we could have come up with a project just as good as the Spanish one, if not better” (Personal communication, October 9,1999). Such foreign investment control over the use of design professionals smacks of an earlier, pre-Revolutionary era when local talent and projects were crowded out by foreign influences (Rigau 1994). Another problem is carrying out high-standard hotel and housing projects by foreign architects. Every great city needs architectural works from different countries, but they should be first-rate architects who can enrich the city with relevant projects that can situate the city on the universal cultural map, [the architects should not be] just anonymous servants to investors who at times are rapacious and uncultured. Nonetheless, many of the recent foreign projects are far from this goal of excellence. Why allow this, when some Cuban architects are better than some of the imported ones? Why pay hundreds of thousands of dollars for irrelevant projects? Why don’t we use the normal procedure used on all important projects around the world: that its, hold a design competition and let the best one win? With such a procedure, Havana would also win (my translation). There are, then, voices of reason. One hears often among design professionals, architects, and planners that there are no “young urban professionals” residing in Habana Vieja.9 This feature attests to the revolutionary view of the socialist city that is defined by an absence of “young Cuban Americans”10 of the Miami ilk. Most residents of Habana Vieja displaced by historic preservation must relocate in Habana del Este, across the bay on the eastern side of the city (Table 1). This is the site of some of the first public housing projects in the 1960s. Many habaneros consider it unattractive because of its poor sites and services, public transportation problems, and badly maintained grounds (Hamberg 1994). Although no official data exist, I estimate that Habaguanex has displaced at least 200 residents. How can displaced local residents be justified in socialist Cuba? In the meantime, ordinary citizens wait for improvements in their residences as this uneven development manifests itself at different geographic scales of analysis. Nationwide, nearly half a million workers have been downsized from state jobs since 1990. Those who have not retired seek employment among the new self-employed, cuentapropistas, who amount to about 150,000 workers in a nation of 11 million. On average, they earn as much as 3.5 times state workers. Many self-employed work in the old quarters of Havana (Peters and Scarpaci 1998). As noted above, the state built new housing in the early 1960s to accommodate those displaced from eradicated settlements because one in twenty Havana households lived in squatter settlements. Habana Vieja absorbed a sizeable share of relocated squatters. One building in particular represents what has happened elsewhere in the old city. On the northeastern corner of the square rests a stately apartment complex built in 1904. Much of the ornate plasterwork and some of the balconies have fallen off the six-story apartment building over the years. By the late 1960s, the former single-family apartments had become homes to several families. Crowding compounded the interior deterioration. In 1996, a joint venture Italian-Cuban project began renovating the structure into condominiums. Future occupants will be foreign business people working in Cuba, not residents of Habana Vieja. Foreigners will rent the apartments from Habaguanex and will pay in dollars, not pesos. The adjacent Plaza Vieja has been restored with an expensive ornate Italian-marble fountain11 in the center of the plaza, and the perimeter of the plaza is framed by metal spheres to prevent vehicular traffic. Officials12 at Habaguanex justify such building renovation, civic beautification, and residential displacement. In the end, the preservation of a collective, socialist order will be ensured since social property remains the sine qua non of the Cuban Revolution. Habaguanex and the socialist leadership are, in the words of one company official “in [the preservation business] for the long haul.”13 These and related examples are just a few anecdotes surrounding the many winners and losers surrounding Habaguanex’s foray into accommodating foreign investors (Table 1). Habaguanex, S.A., the restoration company in Old Havana, operates in a unique political and economic environment that has given it special abilities in attracting foreign investors. This paper has attempted to identify the merits and detriments of the firm’s behavior within the logic of the socialist system. In many ways, a post-Soviet era of downsizing and foreign investment in tourism has made tourism a viable option in a socialist Cuba that once refused to create another island of bartenders and chambermaids. To be sure, foreign investment exacerbates household income differentials but, for some workers like Tomás Obrapía, it is a survival mechanism. As Gunn observed (1993, 15): present conditions in Cuba suggest that while rising foreign investment is undermining Castro’s power in several important ways, this subversive effect is balanced by other sociological results of foreign investment that actually consolidate the system…That balance could easily change, however. If investment rises faster and spreads further [sic] from the tourism enclaves… then the class of privileged workers will grow, and the contrast with the hardships of their neighbors employed in state enterprises will become more evident. Seven years after her observation, such contrasts are even more striking, especially in Habana Vieja. Income disparity and the contrast of housing stock between tourist facilities and locals call attention to a long-standing debate in socialist planning about moral versus material incentives (Zhao 1995; Rohter 1995; Szlenyi 1982). Habaguanex will continue to serve as the redevelopment engine of Habana Vieja. The approval by both houses in the U.S. Congress that permit the sale of food to Cuba may allow some of the Habaguanex and joint-venture facilities in Habana Vieja to lower their costs, but that is likely to be a small benefit. Objectively, we still must question the nature of historic preservation in Habana Vieja. 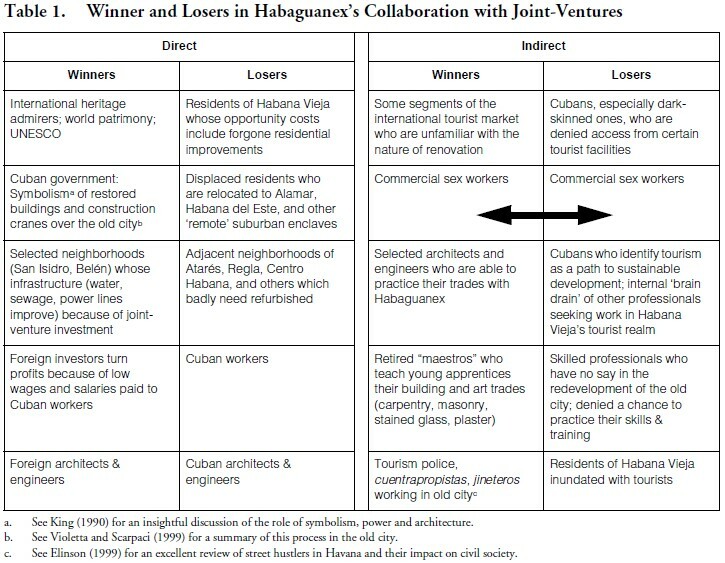 While it is true that “Cuban officials…have toned down their socialist rhetoric to make overtures to entrepreneurs overseas” (Jatar-Hausmann 1999, 128), salvaging the urban heritage is an easier sale because of the seemingly apolitical appeal of safeguarding an element of past culture and architectural design. One need only walk through Havana and see the numerous restoration projects donated gratis to appreciate this powerful allure. This free contribution (mainly from Spanish and Italian architectural societies) of money, materials, and technical skills also makes Habaguanex unique in its relationship with foreign economic associations; Canada’s Sherrittt International Corporation does not donate nickel-mining machinery and Spain’s Sol Meliá will not give hotel furniture for goodwill only. Michael Edwards, the former Civil Society Specialist of the World Bank, argues that globally the past 50 years have been characterized by corporate and state meddling in the lives of the poor. He contends that the next 50 years should witness co-operation as the dominant discourse in development circles. “The changing global context makes co-operation both more necessary and more possible. There has never been a better time to pursue the vision of a more cooperative world” (Edwards, 1999, 23). Restructuring in Habana Vieja unfolds without consulting local residents even though some Cuban planners and social scientists encourage such collaboration in Habana Vieja (Collado et al. 1996; Dávalos and Velázquez 1996). Furthermore, neither tourism nor revitalization develops at the grassroots, despite Cuba’s intent on using mass organizations to further the goals of the revolution (cf. Arnold 1999). Habaguanex guides this restructuring and enters into agreements with foreign partners to facilitate a limited process of capital accumulation not unlike revitalization projects in Baltimore and other U.S. cities (Smith 1979; Smith 1987; Smith and Feagin 1987; Harvey 1985; Holcomb and Beauregard 1982). Cooperation with civil society is not part of joint-venture operations in Cuba. Only Habaguanex can bring Habana Vieja into the new millennium and avoid the kinds of economic and social exclusion that urban revitalization and restructuring create in historic districts outside Cuba. Voices of concern about the joint-venture frenzy, which brings both bad design to the city and excludes Cuban professionals from gainful employment, will be drowned out by the stampede of investors to the UNESCO site. In that case, there can be no winners. 1. Though there may be a very small gentry class of artisans and “hustlers” living in Old Havana, they lack the kind of purchasing power required to enter the dollar-driven foreign housing market. Even if they could, they cannot legally purchase new construction under current law. 2. According to Burr (1999), the company was launched in 1994 with just $20,000 in state financing. Today it runs four hotels (including the four-star Santa Isabel, and the Ambos Mundos (Hemingway’s old haunt), 13 restaurants, 13 cafeterias, 10 open-air bars, 22 shops, a bakery, nine markets and a pastry shop). By 2004, the company is expected to have 25 hotels under construction or in operation. 3. On September 5, 1995, the National Assembly of People’s Power of the Republic of Cuba passed Law No. 77/95 of Foreign Investment which superseded Decree Law No. 50, passed in 1982. For an English-language discussion of the act and related commentaries, see Conas (1995). 4. The U.S. based real-estate company and franchise RE/MAX, is now operating in Cuba. In May 1999, its WWW site home page had registered more than 100,000 hits. Enticingly, the opening lines state: “The purchase of Real Estate in Cuba is now a reality! Condos, Homes, Office Space and more. Probably the most anxiously awaited real estate opportunity in the Americas. Hundreds of units have already been sold to astute buyers.” These units, however, are mostly in Miramar and the Monte Barreto complex in the western suburbs. See http://www.realestatecuba.com/. 5. A black glass wall envelopes the roof (azotea) of the original structure. It is a modern design that stands out several blocks away and contrasts with the sober turn-of-the-century façade. A radio station and communication operations are located behind the black glass. Unaccompanied foreigners cannot enter this area. Located at the eastern edge of Havana Bay, the view is exceptional. 6. Habaguanex’s clout in the city and nation has risen and its sphere of influence is not just confined the UNESCO World Heritage Site of HabanaVieja. In late 1999, Habaguanex was granted restoration control of Ricardo Porro’s splendid complex, Escuela de Bellas Artes, located in the western suburb of Cubanacán. The “decision” to allow Habaguanex to direct the renovation of Porro’s 1962 design was made at the highest levels: the Council of State. This is the first large-scale foray by Habaguanex into a project outside the old city. More than a few architects and restoration experts within the Ministries of Culture and Education have expressed displeasure at Habaguanex’s growing sphere of influence. 7. This is one of two claims I make in this paper that I base on 23 trips and five and half months of field research. 8. When Parque Central opened its doors in 1998, though, only a small corner facade withstood the wrecking ball. A swimming pool graces the top floor, but it is on the ninth and not sixth story as originally specified. In addition, the traditional Havana colonnaded walkways are considerably taller than others in the vicinity. See Violetta and Scarpaci (1999). 9. Although Yuppies are not present, there is concern among urban planners and architects about a “what if” scenario should Cuban- Americans in Miami suddenly appear in Old Havana. In that case, the YUCAS (Young Urban Cuban Americans) would likely find much real estate to their liking. Other concerns about a potential onslaught of Florida influences include the “Miamification” (high-rise waterfront construction), “Disneyification” (contrived cultural spaces) “McDonaldization” (chain retailing onslaught) of Havana, or “Cancunization” (Caribbean high-density waterfront development). These points of reflection exceed the scope of this essay. For a consideration of them, see the home page and related links of Cuban-American architect Andrés Duany and his partner and wife, Elizabeth Plater-Zyberk, at http://www.dpz-architects.com. It is noteworthy that despite the highly polemical debate about Cuban-Americans desires for transforming Havana, there is strong agreement that it should not become another Miami (e.g., turning its back to the sea, becoming a highly automobile-reliant metropolis, and other maladies of late 20th century suburban sprawl). See Kunstler (1996) for a succinct review. 10. For a hypothetical discussion of how Havana might have looked had the revolution not occurred see Segre at al., 1997:324-26. 11. I have heard that the Carrera-marble piece cost half a million dollars. 12. Eusebio Leal Spengler has requested payments to Habaguanex for his interviews, approximately $1,000 USD per conversation. Generally, only prominent journalists or politicians can speak with him. This information comes from personal communication between the author and journalists from the Dallas Morning News, Times-Picayune, Ft. Lauderdale Sun-Sentinel, Condé Nest Travel, and U.S. News and World Report. 13. I had these interviews with two administrators of Habaguanex on March 6, 9, and 10, 1998.